Let's make a cute quilted heart pillow for Valentine's Day! Half Square Triangle quilted patchwork pillow by Daydreams of Quilts. This tutorial was published a few years ago but I've given it a refresh. This post contains affiliate links - for more on affiliate links please see my "About" page. Trim up the edge of your fat quarter so you are starting with a straight edge to measure from. Trim a three inch strip from your white/low volume fabric (or cut 3" squares from scraps). You need 5 three inch squares for the parts of your heart where there are half white and half red HSTs (half square triangles). Sub cut the 3 inch strip into 3 inch squares as above. You also need thirty-four 2 1/2 inch white/LV squares for your background. Do the same with your red fat quarters or scraps. You need twenty-five 3 inch red squares. Draw a diagonal line on the back of each 3 inch white square and on the back of ten 3 inch red squares. I put my fabric on sandpaper to do this to keep if from sliding around and distorting while I'm pulling the pencil along it. If you use a Pilot FriXion Point Erasable Gel Pen you do not need the sandpaper as the pen runs more smoothly on the fabric. Match up your five white squares with five red squares right sides together and match up your remaining red squares into pairs right sides together. Sew a quarter inch down either side of your pencil line. You may find it easier to put a piece of tape on your machine at the quarter inch mark and line up the points of your squares with that. I sewed one at a quarter inch and then decided to move my tape over one tick to the scant quarter inch line because I was working with such small pieces and I wanted more trimming room. (I ripped the quarter inch seam out and replaced it with a scant quarter inch seam.) It's up to you and what you prefer with your own machine. Here you can see the corner and pencil line lined up with the tape. Chain piece your squares through the machine. Just keep feeding them in one after another. This saves time and thread. Here is one going under the presser foot right after the one before it without cutting thread. On the last square cut your threads and pull your chain out from behind your machine and feed it through again to sew down the other side of the line. Clip the seams between your pieces with embroidery scissors or a thread cutter . Give each set a little press with the iron to set the seams. Line up your ruler on the pencil line. I like to line up the quarter inch line on one of the seams to make sure I am making an accurate cut. Then cut down the centre of your pencil line with your rotary cutter. Here we have two HST units now after cutting down the pencil line. Press your seams to the dark side (or you can press them open if you prefer as these triangles can bulk up the seam allowance further on in the project). Line up your square on your grid mat with your diagonal seam lined up on one of the 45 degree lines on your mat. If you have a Creative Grids Quilting Ruler 2 1/2" Square it is easier. I got one after this tutorial and I love it! A OLFA 12" Rotating Self-Healing Rotary Mat is also helpful at this step because you can rotate the mat to cut all sides of the square without moving the fabric or ruler. I bought one and it is now indispensable when sewing HSTs. Square up all four edges of your square to 2 1/2 inches. In the photo above you can see the bottom square is lined up with the seam on the 45 degree line on the mat. (The little black arrow is pointing to help show this. )This allows you to cut your square so that it is squared up on that centre seam. The square on the top left is the one where I forgot to do that and my seam is not in the corner (little circle is showing my mistake). When you are finished trimming all your blocks you will have a little pile of trimmings like this and all your HSTs will be all lovely and squared up. This step is tedious but important and fortunately there are not too many to trim for this project. Lay out your HSTs to create a heart and then surround them with your 2 1/2 inch white/LV (low volume) background squares. You should have 8 rows of 8 squares each. Stack your squares one on top of the other moving from left to right and number each stack from 1 to 8 so you don't get mixed up taking them to your sewing machine. Sew one row at a time pressing your seams in opposite directions. I pressed row one to the right and row two to the left and so on. This creates locking (or nesting) seams and helps your squares line up better when you sew them together. 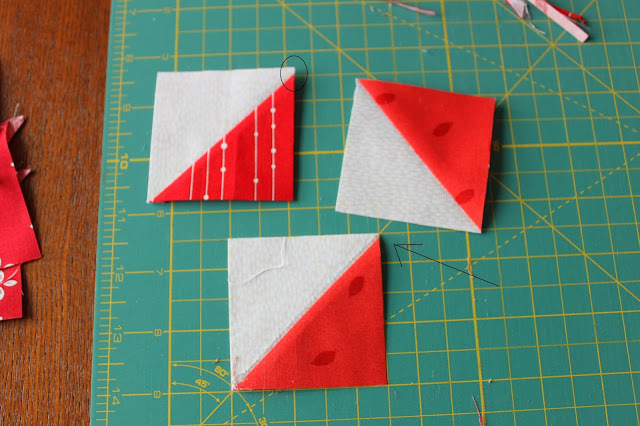 I pinned at each intersecting seam even though they were nesting because these triangles can be tricky to keep lined up when they are going through the machine. I sewed row one to row two and then pressed that seam open. Then sewed row three to row two and pressed that seam open and so on. At this point I found it was better to press seams open than to the side because there was a lot of bulk where the corners met up. When you are all finished sewing your rows together you should have something like this! :) Mine measured 17 x 17 inches. Here you can see that I have seams going in opposite directions on the back and then the row seam is pressed open. Layer your quilt top with batting and a muslin backing and quilt it how you would like on your machine. I just used simple stippling for my quilting. I used red thread on the heart and cream thread on the background. You don't have to put the muslin on the back but I didn't want all the lint from the batting going down into my feed dogs and filling up my machine. My quilt top was 16.5 inches by 16.5 inches after quilting. Choose some fabric for the back of your pillow. I cut two pieces 10 inches by 18 inches. If you cut carefully you could get away with using a fat quarter for this. Fold a long edge over half an inch and press. Fold half an inch again and press again. Do this to the other piece as well. Top stitch down the edge of your pieces to create your hem. Put your quilted top face up and your pillow back pieces face down with the hems overlapping. Pin all the way around to hold everything together. Sew a half inch seam (or quarter inch if you prefer) all the way around twice. Remove pins as you go. Trim your corners so you can get them nice and square when you turn your pillow cover right side out. Insert your 15 inch pillow form and enjoy! Here is the view of the back. This project took me about six hours from start to finish but I was stopping along the way to take photos so you might get yours done quicker.